Review: The Unbeatable Squirrel Girl #1…Again! Unbeatable Squirrel Girl is one of many comics being relaunched as Marvel’s latest crossover event, Secret Wars, winds down and comics are allowed to have self-contained plots again. As much as I would like to provide an explanation of what Secret Wars is and how it shook up Marvel Comics continuity by taking characters and plot elements from multiple different continuities and combining them all into one singular universe, I can’t. I never understood it much to begin with, other than the basic explanation that all the various Marvel universes and planets were destroyed and reconstituted into things like the planet A-Force takes place on, where every female superhero lives in one massive team, or Captain Marvel and the Carol Corps taking place on an isolated world Doctor Doom created when he rebuilt the universe. Aside from fun touches like the role of Thor being more like the reality police, able to enforce Doom’s will from dimension to dimension, not much of Secret Wars really stuck with me. I spent 2015 in Marvel Comics focusing solely on individual series and waiting for the big event to be over. With that out of the way, let’s talk about The Unbeatable Squirrel Girl, one of the most unique Marvel Comics I’ve read in ages. With the possible exception of Miss Marvel, the first Unbeatable Squirrel Girl run was easily the most lighthearted, entertaining, and straight-out fun series Marvel had to offer this year. Ryan North’s writing is silly and irreverent without being ridiculous, and Erica Henderson‘s art is bright, colorful, and clean – though it does have some quirks I want to talk about. The Squirrel Girl relaunch picks up where the initial series left off, with two major changes: Squirrel Girl is now a member of the New Avengers, and she is no longer considered a mutant in Marvel Comics continuity, if the “Doreen is medically and legally distinct from being a mutant, and I can never take this back” line is to be taken seriously. While other comics would probably spend an entire issue making their protagonist mope and sulk and pontificate about what it means to be an Avenger, and if they’re truly worthy, and what this could mean for their future, and all the people they’ve lost along the way, eventually stopping a mugging or other small crime to remind you this is in fact a superhero comic you are reading, USG takes a different route: Doreen waves the teleporter to Avengers Island off as being cool, but unable to take her to the moon, and promptly rushes off with her roommate for a lunch date with Squirrel Girl’s parents. Ryan North’s strength has always been his witty and hilarious dialogue, and every line in Squirrel Girl proves that. What would take another comic months to agonize over, Squirrel Girl drags into the open and has a healthy discussion about before moving on to tell more jokes. There’s no worry that Squirrel Girl is going to be bogged down with angst and there’s actually no real acknowledgement of the Secret Wars situation at all, short of the New Avengers aspect. (I suspect the mutant mention has to do with the weird position the mutants of the X-Men occupy in the Marvel universe now that Inhumans are becoming more and more prominent.) Unbeatable Squirrel Girl is not a comic that is interested in wasting time. Writing, of course, only carries a comic book so far. 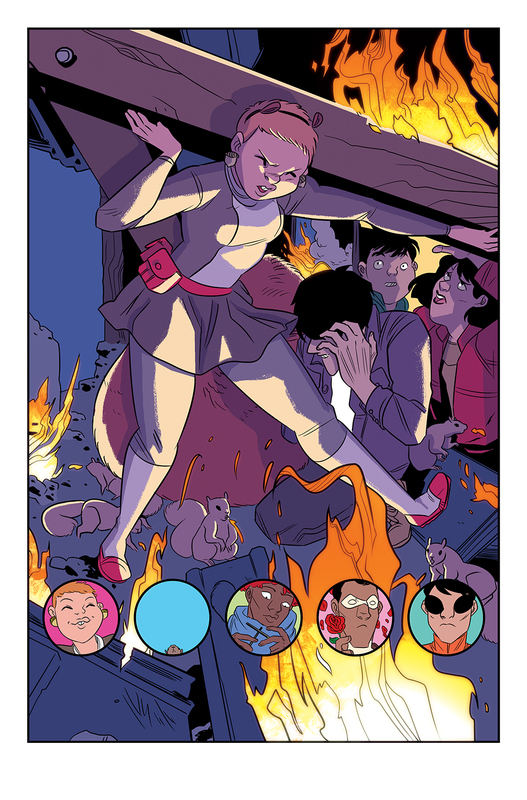 The art style in Unbeatable Squirrel Girl can be kind of a mixed bag – I love the clean lines and bright colors, I love how you can always tell what’s going on in every panel, and Erica Henderson has a great sense of composition that shines through in every page. This is tempered by some odd facial expressions – her characters’ mouths look contorted in odd ways and as much as I like the artwork it’s sometimes distracting how similar everyone’s faces are. 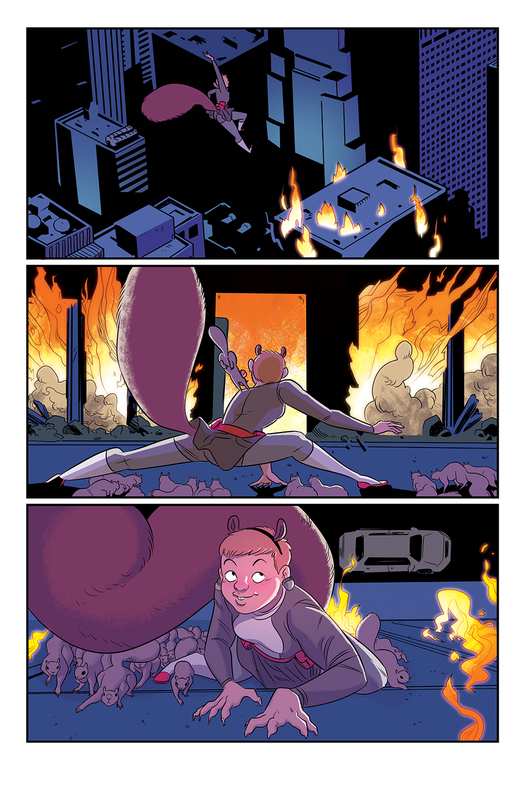 In the original run of Unbeatable Squirrel Girl, so many fight scenes happened off-panel that I began to wonder if she couldn’t draw them. But in issue #1 of the relaunch we see much more action and much more dynamic poses than we did before, so I think she just didn’t have an opportunity to showcase her abilities because of how the issues themselves were plotted. I could be wrong, but I am nothing but optimistic about the future of USG from both a writing and artistic standpoint. Unbeatable Squirrel Girl is a rare oddity in a medium dominated by grim and gritty reboots: it’s a fun, silly, genuinely entertaining adventure with a protagonist who prefers to talk to villains rather than throw them down elevator shafts, a series that’s safe and accessible for kids while still being a great choice for adults tired of dark, brooding antiheroes. It’s one of the most encouraging and positive comic books out there and everything about it – from the fourth wall breaks and running narrator commentary to the nods at Marvel Comics canon present and past – makes it an enjoyable and fascinating read. If all of Marvel’s comics are relaunched as successfully as USG, 2016 is going to be an amazing year for the House of Ideas. Daphne purchased her own copy of Unbeatable Squirrel Girl #1. And after the relaunch she did it again.